Use the following key literary features. 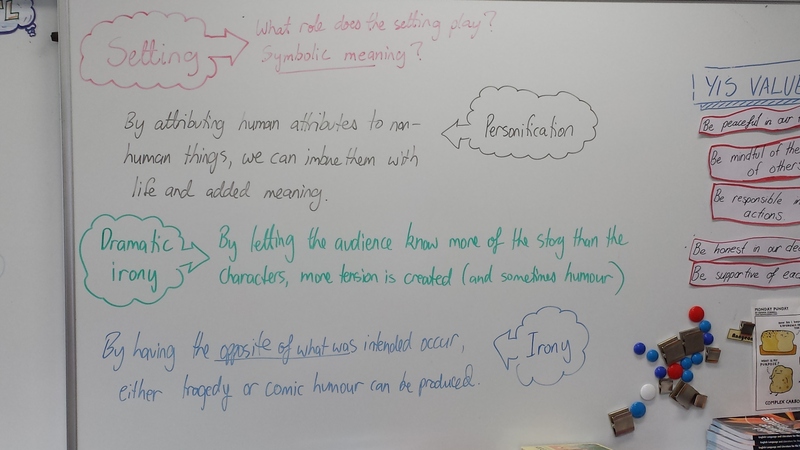 Practice using the correct key term and describing the effect on the audience. There may be more features in your chosen passage; use your key terms list to help here. Next week we will have our final summative assessment for part one of the course: an in-class paper 1 comparative analysis practice exam. 1) Read pages 56-57 and 61-66 if your textbook (Philpot, B’s ‘English Language and Literature for the IB Diploma’). 2) Complete activity 2.10 on page 67. 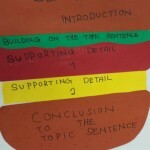 Make a note of these cohesive ties / linking terms – they will definitely help you to write a successful analysis essay. 3) Look at the example texts on the photocopy (handed out in class on Monday 18 November). Analyse, annotate, make notes. If you were going to compare and contrast these texts in an exam, what aspects would you talk about? Which parts of the text would you use as illustration? How would you structure your piece? Make all necessary highlights and notes. 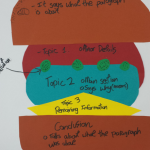 4) Have a go at writing a practice essay. Normally, you would get a whole 2 hours. However as we will be completing this in class next week you will only have 90 minutes. (Pre-reading and analysis done for homework). 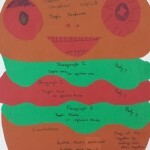 5) Look at a sample essay (available from me) and assess using the rubrics. Then compare your assessment with that of an examiner. Preparation complete! As we are completing FOAs this week in class preparation time will be limited so you will need to start this process as homework this week. Next Tuesday we will do step number 5 as a class (feel free to start as soon as you are ready though! ), and we will do the exam on Wednesday morning. Growing up is an important theme in the novel Two Weeks with the Queen. Morris Gleitzman explores this theme through the maturation of the protagonist, Colin. He shows us that difficult events help us mature, and as we do so we become less self-centred and more thoughtful about the needs of others. 2) Select three supporting points from the novel that help show us this idea. 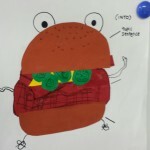 You could focus on symbols, events, characters and their actions, relationships and so on. 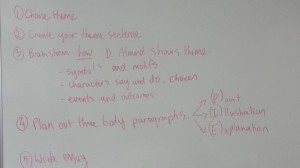 3) Topic sentences for body paragraphs. For each of your three points, write a topic sentence connecting the topic of that paragraph with your thesis. Colin’s whining, selfish behaviour and treatment of Luke at the beginning of the story are characteristic of an immature person, desperate for attention. Colin’s actions to help Ted show a shift in thinking; instead of acting out to satisfy his own needs, he begins to do things to help others instead. Colin’s decision to return to Australia to be with Luke shows his ultimate change into a more empathetic young man. He has given up his futile quest for glory and instead accepted the reality of the situation; something we all have to do as we mature. 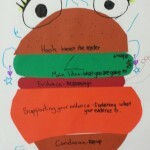 b) Order of importance: going from least important to most important, or most important to least important. c) Chronological: are events in a time sequence? What comes first? What comes next? An example from ‘Two Weeks with the Queen’: Since he is growing up, going from immature brat (at the beginning of the novel) to mature and caring young man (by the end), it make sense to put the ideas in chronological order. 5) Find illustrations / evidence. 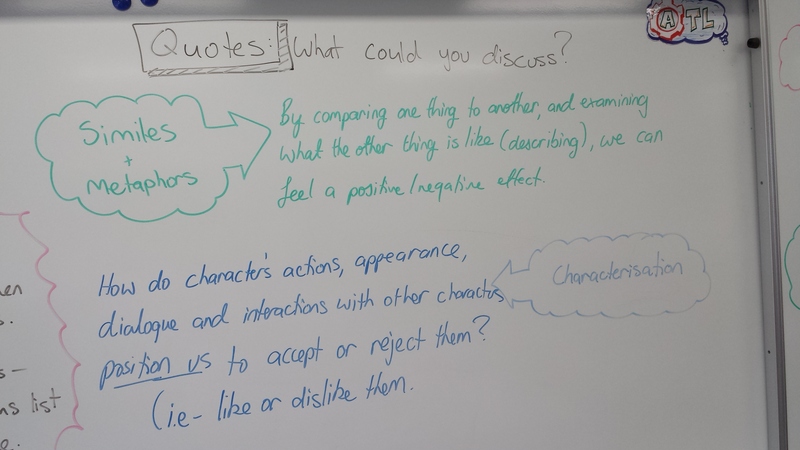 Now, you need to find illustrative quotes from the novel to help show/support your topic sentence. Look for interesting descriptions, character actions, dialogue and so on. 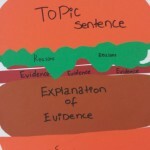 You should find at least one for each topic sentence. 6) Next, explain each quote. How does that example prove your point? Might there be any other examples? What else could you say about this topic? 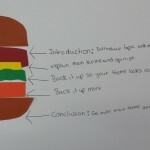 7) You have finished your body paragraphs. 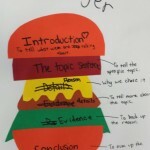 Now all you need to do is create an introduction and a conclusion. * Leave the reader with a challenge or poignant thought; link to the future? 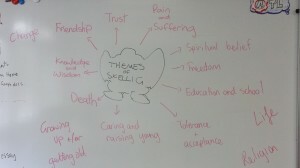 In class today we started our final task for our unit on Skellig. 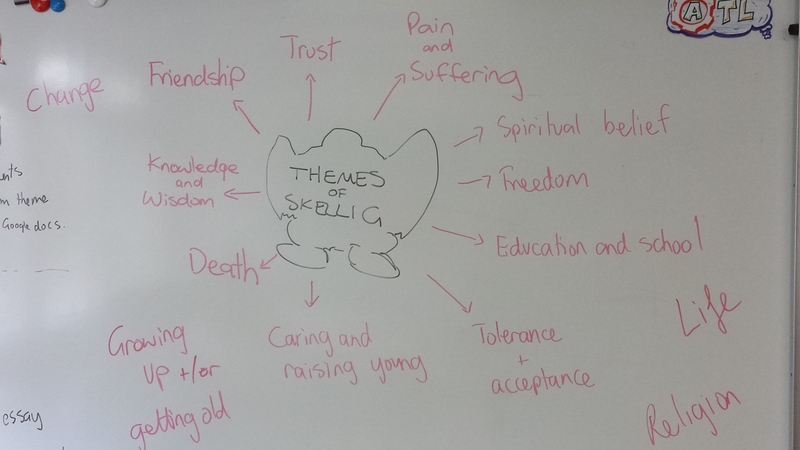 First we brainstormed various themes that we thought Skellig explored. 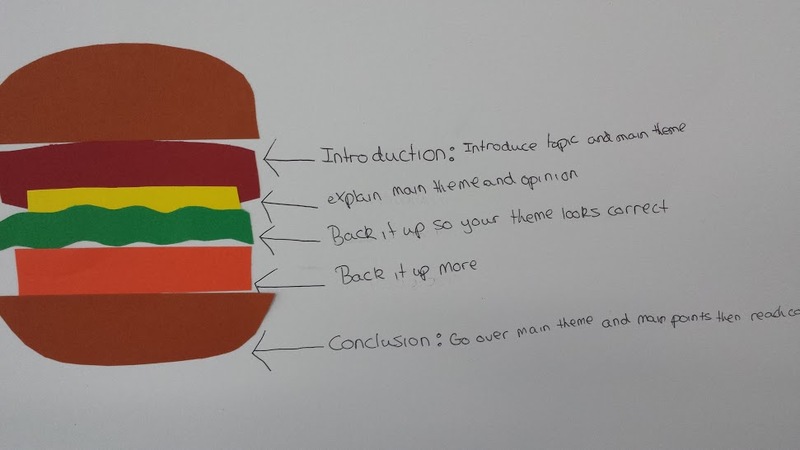 Remember, a theme is a big idea or central topic of importance in a work. It is often timeless and universal (like a concept), such as ‘love’ and ‘death’. The tricky part is in figuring out what David Almond was saying about that particular concept. E.g., ‘knowledge and wisdom’ – where does it come from? How can it be best acquired? What examples from the book show us this? 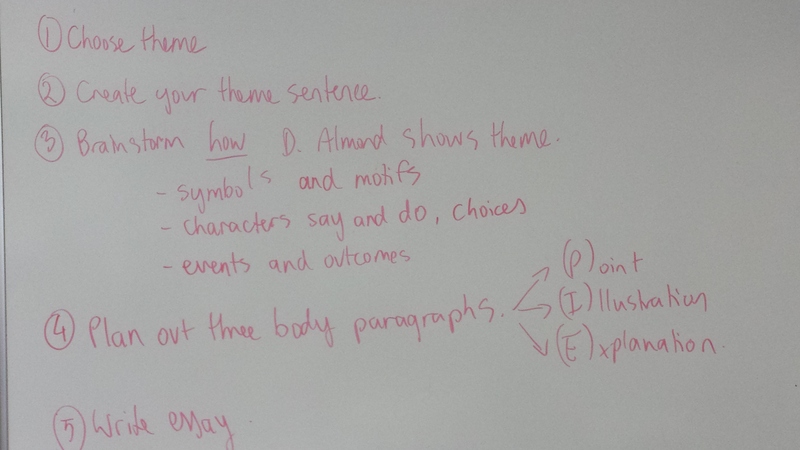 With the process laid out, we began our planning for the essay. Time will be given in class for this assessment, and the due date is Friday 18 October. Good luck!